Described as a good species by Lee. Rhododendron phoeniceum as described by Lee is an evergreen, tall-growing, early-flowering azalea with scarlet-red flowers. This accords with the description given by Galle, who believes that it is probably a hybrid with Rhododendron mucronatum as one parent. A large shrub, to 3m, with purple flowers, the upper segments of which are spotted. This is the plant figured in Curtis's Botanical Magazine as Azalea ledifolia var. phoenicea, synonym Aazalea indica var. aliorus, with pinkish purple flowers, spotted a deeper colour. ‘The richly-coloured flowers of this plant makes a brilliant appearance in the greenhouse during the months of January and February, and form a striking contrast with the more frequent white-blossomed state; but the present is by no means so ready a flowerer. That it belongs to the same species (and not to the A. Indica) there can, I think, be no question; it possesses all the essential characters, and the fragrance is similar, or perhaps more powerful, and evident to persons who are insensible to that of the white kind. [BM t.3239/1833]. Rhododendron mucronatum is usually described with white flowers. See Rhododendron indicum ‘Alba’. Listed in all published catalogues [T.76/1843]. Rhododendron ledifolium D.Don is also given as a synonym of Rhododendron pulchrum Sweet by some authors. 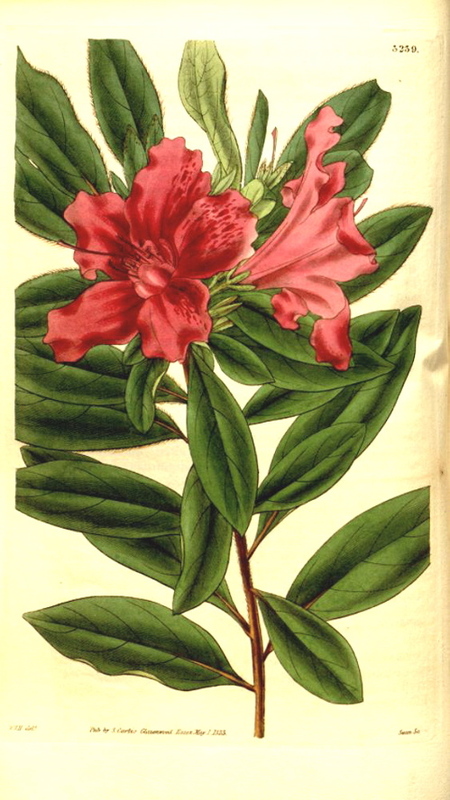 The identity of Macarthur’s Azalea Indica phoenicea is uncertain. See also Rhododendron pulchrum Sweet. China or Japan. Probably of garden origin.